I tried on both my international g4 and my Verizon g4 using the Samsung adaptive charger, a Verizon qc 2.0 charger and an aukey qc 2.0 charger, and the most I could get was about 35% in 30 minutes. My note 4 and s6e can do about 50% in 30 minutes on these chargers. Anyone actually able to get 50% in about half an hour charging? I chose the Cliq because I needed to be with TMobile and I wanted to try Android after my less than stellar experience with Palm Pre. And I love the Cliq -- and have had no issues with it. I do miss rooting it -- the Palm Pre had great developers over at Palm Pre Central who made rooting so easy and relatively safe -- never had an issue with rooting. But the Cliq does all kinds of stuff without rooting so I find it's great just the way it is. My coworker has a Droid, and I just don't like it -- too bulky too square and for my money I don't see the big difference in abilities. There's a pretty good thread gong at XDA over this. Looks like the amperage is only increased by 20% over stock charging. I hope to be able to test 2 G4s side by side tomorrow as long as best buy doesn't screw up my pre-order. Might need a firmware update. By quick charge 2.0, I am referring to near 50% in 30 minutes for the first 0 to 50-70% like the note 4 or s6. I can get 37 to 100% in around that, well justa hair less than that, but peak charging rate is somewhere around 35% in half an hour. You can see my charging profile here. Qualcomm leaves themselves some wiggle room by stating "upto" but mine seems to be only slightly faster than Qualcomm 1.0. It did 70% in one hour today which was a bit better than before but about twice as slow as I would expect for 2.0. It's no bad compared to what it is on a conventional charger but disappointing nontheless. 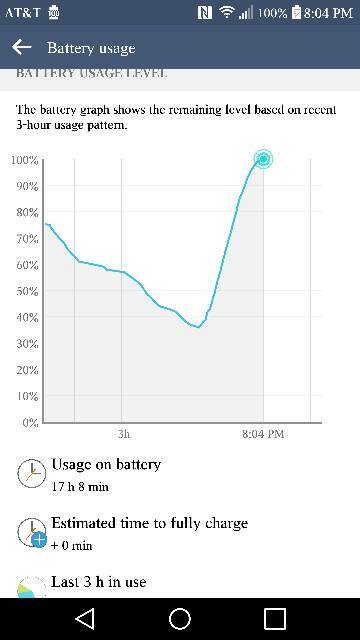 Whether this is related to firmware, software, or the battery used, I don't know. Perhaps time will bring a better answer and hopefully some improvement. Charge case for an S4 ACTIVE? I want S-Voice to play music via Rocket Player, and not the stock app. How can I do this?